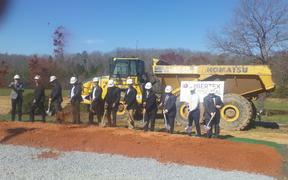 State and county officials gathered at the site of a proposed Fibertex manufacturing facility Thursday to mark the company’s expansion into Randolph County with a groundbreaking. Based in Denmark, Fibertex Personal Care announced in August of last year that it would locate its first U.S. manufacturing operation at 850 Pineview Road in Asheboro on what once was the Goodyear wire plant campus. The property is now owned by J.P. Thomas & Company, Inc., which sold a parcel of the land to Fibertex. The new facility will be located on the site of the old Goodyear tennis court and baseball field. Construction is expected to begin in the coming weeks. Officials hope to be in production within a year. Company CEO Mikael Axelsen said Fibertex is in talks with NCWorks (www.ncworks.gov) to begin the hiring process next month. He did not discuss wages; however, salaries are expected to be competitive with other manufacturers in the area. Elbert Lassiter, Randolph County Economic Development Corp. chair, started the ceremonies by thanking all of the state and local participants in the process. “We are proud of role we have played in this,” he said. Lassiter said the recruitment effort was a team project between local officials, the Economic Development Partnership of North Carolina, N.C. Department of Commerce, Duke Energy, Piedmont Gas and Norfolk Southern Railroad. Will Miller, N.C. Department of Commerce assistant secretary, said any day that the state could welcome a $114 million dollar investment and 145 new jobs was a good day. Randolph County Commission Chair David Allen likened the new project to planting a garden in spring. As a symbol of that new start, he offered Axelsen a package of carrot seeds, noting that he had done some research and discovered Denmark grows a lot of carrots. Asheboro Mayor David Smith gave company officials their first piece of art to hang on the soon-to-be constructed walls of the factory — a full-size gold shovel to commemorate the groundbreaking ceremony. Smith pointed out the former Goodyear campus has plenty more available land for development, adding that Fibertex was a good start. “This shows that Asheboro and Randolph County are open for business,” he said. Axelsen said his company two years ago began looking for a place to locate in the U.S. One year ago, the company settled on the Randolph County site. He said he and his team have been very pleased and impressed with the reception they have received in the county and the expression of teamwork from all involved in the project. Fibertex Personal Care is among the world’s largest manufacturers of spunbond/spunmelt nonwovens used in the personal care industry to produce diapers, feminine hygiene and incontinence care products. It was founded in 1968 and expanded in 2007 with its high-quality print subsidiary, Innowo Print. It has operations now in Denmark, Germany and Malaysia. The company’s expansion will be aided by a $2.1 million incentive package approved by the Randolph County Board of Commissioners and Asheboro City Council in August and shared equally by the two governing bodies. The incentives will be granted over a seven-year period with anticipated tax revenues during that period totaling more than $3.5 million.